Market Sentiment Watch: We noted in recent weeks that the big, liquid, "safe" names that the talking head crowd has been recommending in lieu of actual research (and they are good companies to be sure) are not participating to the same extent in the recent group move as the quality but somewhat abandoned names of our domain (normally rapid growth, cost reduction oilier than not stories). In fact those big household name mini-Majors of the E&P realm may be getting used as ATM's for purchases of their smaller peers. If this was acreage, we'd say the Street is selling the Core and trading down to cheaper Tier One acreage, except it's less of an actual delta in many case in terms of asset quality than it is one of perception. In today's post please find the natural gas inventory slide show (in line with expectation though a last minute boost to the Bloomberg consensus made it a beat), our monthly natural gas macro (production for a second month failing to make a new high, imports on their heels (with record exports to Mexico), and record demand), a round of cheat sheet updates to catch up with 1Q15 reporting names to date, and some other odds and ends. If you are long time subscriber you have our thanks and we ask that you send around the link to this post as it is open to the public above the comments area. If you are interested in subscribing to the site, please contact us at zman@zmansenergybrain.com. Have a good a weekend. Crude oil moved up $1.05 to close at $59.63 on dollar weakness and momentum, defying reports of fresh new highs out of Saudi and OPEC as a whole. Yemen and Libya continue to add to the renewed attention to a risk premium in our view. The front month now looks like this. However, we would note that Saudi's over production is meeting higher consumption and we expect to see further commentary on that in May. We are in the middle of the expected near term range (as per our comments for several months now each Monday) and we would expect some analysts, having overshot the mark, to now feel compelled to begin slowly lifting estimates and consequently "liking names higher" after having recommended punts in December and January. This morning crude is trading flat. Iraq Watch: Iraq's oil ministry is reporting record high export levels of 3.08 mm bopd last month, up from 2.98 mm bopd in March. Given the lack of capex and the security situation in the country we don't see the move as sustainable nor do we Iraq's prior production targets as makable. Natural gas rallied $0.145 (+5.6%) to $2.75 yesterday after EIA reported what would have been an in-line injection the night before but was turned into a beat by a last few hours surge in the expectation for the build. Either way, at 81 Bcf, the number was above the five year average and just shy of record territory but below the prior week's record injection and that likely prompted a bit of a short cover as gas failed to break the recent range. A growing chorus of voices taking note of E&P promises to curtail in the northeast Marcellus in 2Q and 3Q over weak pricing likely buoyed gas as well. This morning gas is trading off a penny early. Production Watch: February data shows modest rebound but volumes remained below December peak and a number of big, easily identifiable wedges (states) of production continue to edge lower, something that was happening prior to the rig count implosion. "Other States" production, which is driven by the Marcellus, also failed to make a new high. This is short term stuff and we are not read to call for a drastic rollover this year but (and to a lessor extent than it is with oil), the writing is on the wall for lower production levels. Still, volumes are up 7.4 Bcfgpd YoY (leading to the as expected steeper slope of the injection line) and we don't expect a marked decline this year in volumes (but for YoY growth to evaporate by 4Q15). Net Imports Watch: Flat YoY and declining in a bit of a sooner than expected fashion (it was still winter for this data). February came in at 3.8 Bcfgpd net, vs 3.9 Bcfgpd a year ago with a little more gas coming down from Canada but record volumes heading south of the border to Mexico. See graphs below. Demand Watch: All time record (for February or any month) driven by space heating demand that drove record Residential and Commercial demand, record gas-fired generation for the month of February and the second highest level of February demand from the Industrial sector. A quick chart but then see the detailed demand section below. 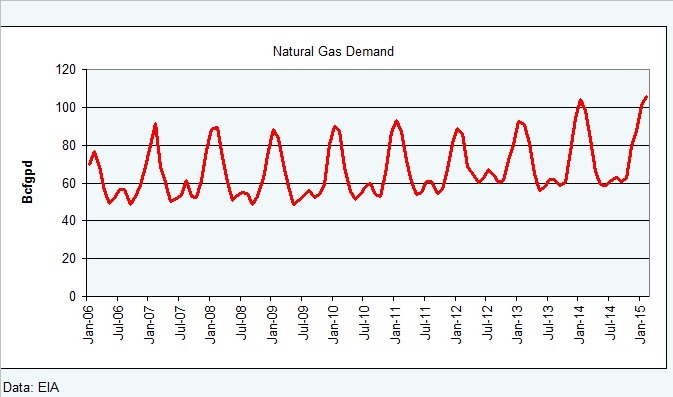 We continue to anticipate a move back to record gas-fired electrical demand this summer as well as continued inch up with record levels (on the heels of a record year) for the Industrial sector. Cheat Sheet Updates - these are names that have reported 1Q15 results but for which we didn't have time to update the sheet at the time. We included SWN as well (they reported at night and we had time to include) just for quick comparison purposes. Look for an updated cheat sheet and thoughts on the Sundance quarter in the Monday post. Next week we get quarterly reports from owned names: EOX, EOG, MTDR, ROSE, HK, NFX, REXX, BCEI, CPE, CRZO, MRD, OAS, WPX, EXXI, LPI, NOG, and RICE. And from names of interest by some on the site: APC, BBEP, FANG, CHK, DVN, GPOR, NBL, PX, SM, AREX, CLR, JONE, SN, and BBG. RRC - Barclays ups target from $51 to $55, stays Outperform ... um, price check on aisle reality. This entry was posted on Friday, May 1st, 2015 at 7:18 am	and is filed under AR, COG, Natural Gas Supply, swn, Uncategorized. You can follow any responses to this entry through the RSS 2.0 feed. You can leave a response, or trackback from your own site. AR – Raja ups target from $49 to $51, maintains Outperform. XOP- Upside bias above 51.93. A break of key resistance at 56.21 works to 59. $USD- Oversold now at key support (94.36). Expecting sideways trade around the 95.44 CHVN and below the 96.40 CLVN. Morning Zorg and thanks for the levels. All Bakken related names at levels of interest..
NOG Rejecting 8.37 CHVN as too low…lupside target at key resistance around 9.50. OAS Big well defined base of support for move back to 25. ​WLL Well defined base. First upside target at 55-56 CHVN. EOX Has a long way to go to break the longer volume base at 1.25 but in the short term a break above .68 works back to .88 in a hurry. Funny timing – Goldman getting more bearish on natty. — NOAA’s report that El Nino formally underway puts downside risk to constructive forecast (2h $3.25/mmbtu), though not to forward curve, Goldman’s Damien Courvalin writes in note. Any thoughts on Tesla Energy? Thanks for all the great info Z! re 10 – thanks and not sure what that means. I did a lot of work on El Nino and La Nina a decade ago and the nutshell on that work was that strong and weak El Ninos are too different beasts and still not highly predictive as to temps. PRB backing out gas demand is what I assume they mean and I'd ask them to check their heat rates and think again. re 11 – not by me but I am certainly willing to listen. re 12 – hey you're welcome! Great Monthly Nat. gas analysis and charts/graphs as usual! Well worth the subscription for these data w/thoughtful commentary. Thanks Z! jy – thanks much, too kind. Thanks. Yeah, its really great for solar and solves one of the many problems plaguing solar power. I think only 800k homes in the U.S. have panels, so its a VERY small market. It does make you think about the future though. How long until it takes a bit out of natural gas? 10yrs? VERY early beginning of the next wave of energy. SWN – will toss the call position today, no plans whatsover to reduce our SWN ZLT exposure however. We see the name as on of a handful of sleeper names for 2015, much like NFX was called a sleeper by us, a lot, last year. That was somewhat interrupted by the oil price drop which derailed a piece of the story (further deleveraging could have been achieved had they been able to sell China) but mostly is working out as an awakening sleeper. On the oil side by the way, OAS, TPLM, BCEI all sleepers (names that no one cares about until suddenly they glom onto the fact that management is solid, the assets are solid, the costs are lower, and EBITDA margin is troughing this quarter. Z- Did TPLM grow into the heavyweight spot or is that a "vote of confidence"? 1) That coal has peaked but is still a large piece of the US generation pie. Regardless of near term gyrations, I don't see coal recapturing the generation share it had only a few years ago. 2) Nuclear has likely peaked. The number of units is relatively stagnant and some will get added in time but no where near the capacity that can be easily and cheaply added via natural gas. The existing units are aging and have seen multiple uprates each over time, to increase their generation capacity. The ability to further uprate those units is quite limited. So I think nukes are flat at best. 3) Hydro – is tiny and certain not growing. PacNW hydro viability is increasingly strained. 4) Oil – not a contributor in the US, has not been for a long time, is in decline, and won't ever be a threat as a big electricity wedge. So as coal declines in time due to increasingly strict emissions and costs of keeping up with those requirements and of coal itself (mines are shutting down in the U.S.) I see plenty of room for solar (a subset of renewables below) to come up in importance without that being to the detriment, long term, of natural gas. re 18 – It's been hanging out there for quite some time as we added multiple times on dips over the last 3 years. And yes, that's a vote of confidence. It's a more complex story than most E&P analysts are going to like due to RockPile and Caliber but as oil prices firm, I would expect people to move back to the story. They've done a very good job of growing more rapidly than anyone expected so it's not rock and it's not management that has the stock at current levels, it's commodity prices. re 19 – not a full one yet, didn't have time to listen to the call last night, will get to it today, liked everything in the quarterly comments as I went through the cheat sheet, planning to have out on Monday. Trades at a little over 4x TEV/EBITDA this year and the Street looks a touch light to me there but I'm high on price to them so that makes sense (for the oil price average for 2015 that is). Anyway, will circle back to it with a cheat sheet in the Monday post, and may have more comments later today after listening to the replay. Although it is a penny stock by way of SDCJF that is not at all how they present. Management in my view is more than a bit sophisticated. More later but nothing negative so far. Well despite the Goldman coloring of natural gas (I guess they have to do something now that they are softening the lens filter on oil) AR is making a move on the 200 day SMA. COG broke up through it earlier this month and didn't look back. RRC just broke up through it. 3 large Marcellus producers all outperforming the E&P group since mid March. Interesting. SWN suddenly thinking about making the same move and is cheaper in our overall view than those names. Much more of this and the smaller Marcellus names will get a boost too I should think (hello REXX). JBC’s global growth estimate of 1.28m b/d could be revised lower, partly as cars become more efficient, JBC Energy chairman Johannes Benigni writes in note dated Thursday. Well he's high to the big agencies that report on demand in the first place. The car efficiency comment is a red herring. If the 1.28 mm bopd comment refers to this year and he's talking efficiency of cars degrading the current demand number he's smoking something. RE 21 TY. TPLM I hate to hit on something that might have been covered on another day, but was there confirmation they were marketing Caliber? Relative Volume-Nat Gas Stocks…High volume in most names today. Requesting the nat gas names to add to this panel. re 26 – No worries at all and not that I saw. I thought the timing was premature to their prior comments but midstream is different (not really impacted by lower oil prices) and the ability to sell for a good price is unlikely to be negatively impacted and there have been some sales in the state of pipe assets so it's not unbelievable at all. If the news had been that RockPile was going now or in 2016 I'd be hard pressed to believe it. re 27 – I'd add REXX and RICE for certain, probably WPX, ECR, and UPL. Baird ups by $4 to $44, yawning Outperform maintained. Canaccord ups by $4 to $38, stay mark to market Hold rated. SWNC has rallied nice with SWN, now topping $60. RE 27: GPOR is now a natgas stock with 70%+ dry natgas production with the remaining mostly NGL production. There is also CHK. “We are writing to express our deep concern with Russia’s planned delivery of S-300 surface-to-air missile systems to Iran,” House Foreign Affairs Chairman Ed Royce, Ranking Member Eliot Engel say in urging President Obama to consider use of sanctions already in place to deter Russia’s planned delivery. Added 13,500 net acres in EFS in Dimmit, contiguous, others let it expire and they grabbed it at $1000/acre. Maintaining guidance of 7,850 to 8,500 BOEpd 2015 guidance, exceeded 1Q internal by 8%, so see making the guidance for the full year. G&A down on absolute and per BOE basis. No staff reduction, just cut by better cash G&A exp management. We get $118 mm liquidity pro forma; debt to TTM EBITDA as of March 31 < 1.1x not concern there, will expand as the full year EBITDA is driven down by price but not by much. Even in low price environment they see some positive cash flow generation 2Q to 4Q. Dimmit area – contiguous – $5.5 mm to $7.5 mm, – 4 wells meeting type curve, producing w/o lift for 2 to 5 months which is better than expected for artesian flow. Currently not running any rigs, no long term contracts, will add a rig to drill that one last well in 2H and will be completing as noted above the 8 in process wells over 2Q-4Q15 period. A) Drill costs were 5% cheaper than recent shorter ones. Total AFE of $7 to $7.5 mm. A) Not adding to acreage, some will expire, will see 5 to 7,000' reduction – it is not a core asset for the company, will monetize but don't have timing on that yet but will be looking at that near term. Market transactions have been limited so hard to point to pick a comp. Referenced OEDV as a market comp for the acreage. Even if you discount that heavily for a private transaction that could be a significant $ amount to SDCJF which I don't see as in the stock at all at this time (north of $100 mm price tag my guesstimate). Q) Where is the last well to be drilled, will that be one well only or do you start drilling again. Q) guy mentioning 1,200 well fraclog … what price do you see as far as price to get those completed. A) we are different from many as we don't have long term drilling costs so you are seeing that fraclog grow because others have them, but the wells are economic now but they are not completing because they are capital constrained. To him it doesn't make much sense therefore to drill but not complete wells. His gut for a completion wave would be $60s to lower $70s you see people start to complete them. Good call, mostly Aussie analysts as always. Low key, confident, not busy with the drill bit now but big wells to talk about next 2 quarters and maybe a size punt to talk about sometime later this year that could be a major de-levering event for them. re 33 – thanks for those. MRD = slow motion gap fill in progress. Silly analysts, knee jerks are for talking heads. Z where can i find quick access to the "orange" charts on the site? re 39 – Using the pull down menu at upper left (it says "Select Category" when you scroll up to it) you can either select or Orange Charts or ZLT Stats or you can follow this link. check your email… sent you something interesting. would have posted it but too long?? perhaps you can. good thought piece..
re 41 – you're welcome, not yet but data is all there, just have not broken it out. Will check. re 41 – got it, thanks, check your email. Bhh – re that Dan Loeb letter, if you have a link that would be better but I'd guess if you attribute he'd not mind you putting it out there. We recently initiated a position in Devon Energy (“Devon”), an E&P company with a $28 billion market cap. Value is increasingly difficult to find in the E&P sector but Devon stands out by combining limited downside with an underappreciated, valuable asset base that can be unlocked through continued portfolio management and improved operations. Devon’s value proposition is compelling. Subtracting embedded midstream value (and associated debt) and a “non-core” but cash-generative Canadian oil sands asset, investors are creating Devon’s domestic E&P business for the value of the company’s existing US production. As a lucrative kicker, investors also get Devon’s vast “tier 1” acreage positions in the Delaware/Midland basins, Eagleford shale and Cana-Woodford for free. Valuing Devon’s acreage alongside companies like CXO, XEC and PXD – where we see significant asset overlap in certain plays – suggests the market is undervaluing Devon’s US E&P business by $10-15 billion or $25-35 per share. We believe the company has significant scope for improvement on operational execution as management begins to focus its capital in fewer, higher return areas. For example, during Devon’s 2012 analyst day, the company highlighted resource potential in at least 14 development or exploratory plays. In 2016, nearly 100% of Devon’s capital will be dedicated to three high-return areas: the Permian Basin, the Eagleford shale, and the Cana-Woodford. This focus is a welcome self-help, value creation measure. Devon is also making swift progress in enhancing its operations via improved completion techniques. The company is following the lead of peers in testing increased proppant concentration (pumping more sand in its fracs) and longer laterals with positive early results. As these completion practices move from the testing phase to becoming routine, we expect Devon to close the operational gap with competitors, leading to positive production surprises in the coming quarters. 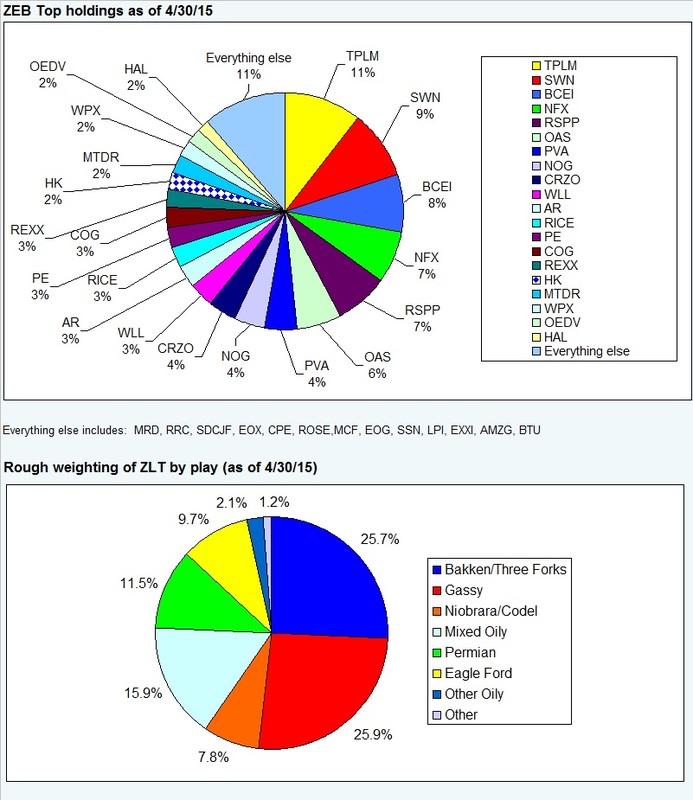 In portfolio management, Devon has executed on a series of strategic moves over the past five years to improve and simplify its asset base, including: 1) the timely exit in 2010 of its international and domestic deepwater assets; 2) engaging in a pair of joint ventures on its onshore unconventional assets that allowed the Company to avoid significant capital costs on what are now non-commercial assets; 3) the 2014 purchase of GeoSouthern, a “tier 1” asset in the Eagleford shale; 4) a value-creating merger of its midstream assets with a public MLP in 2014, since renamed “EnLink”; and 5) the sale of its non-core conventional assets in both Canada and the US. While some of Devon’s recent portfolio moves may have taken longer than investors had hoped, we think the market has begun to appreciate management’s willingness and desire to actively shape their portfolio.To unlock the company’s full value, there is more to be done. We encourage Devon's leadership team to build on its track record and continue streamlining its portfolio to focus on top-tier US assets in the Permian Basin, Eagleford, and Cana-Woodford. RB- favorite global commodity co. "FCX", getting a lot healthier quickly with copper at 2.93 (worth 200M in cash flow for every 10 cent improvement). OT-Z, I think you had some recent experience with Zillow's estimates on home prices-they seem quite a bit below asking prices in NW US-what was your experience and are they realistic? Anyone else with recent experience, would appreciate any cmts. Zorg- UPL looks poised to go up into the vacuum. re 52 – yep, there's a good bit of that going on in gasland at the moment. Z- at what price does crude have to be take EOX out of perceived danger. 51 thanks. If Loeb called GeoSouthern 'tier1' i feel good about adding to PVA. sc4 You may have already found some LINE research but my 2 cents says. Dividends going forward should be OK. The loss on the bottom line was an impairment charge which will not hurt distributed cash flow. Without that charge they earned .58/sh of which .45/sh came from hedges. They had much lower LOE and G&A costs. Actual layoffs. Production up 9% y/y with large capex decline. The big issue going forward will be can they do well enough to pay bonds when due. Needs higher prices for solid growth and any potential dividend increases. PS the NSLP I mentioned 2 days ago up 25%. I have some but should listen to myself a little better..
re 54 – around here helps quite a bit, but higher is better, hard for me to speak to other people's perception of danger since many of them don't use that little thing called math. Off the books trade from last Friday, SWN $26 May calls, coming out for $3, up 426% in a week. Calls are a distraction but that one at least was a pleasant distraction. Pleased with the Street's newfound liking for the name. 58 Great call Z. Put some on Carpe Diem in the Kentucky Derby. Or ask RB for his top choices. re 59 – ha, thanks. By they way, we will be very bullet point focused next week due to the peak of earnings and many, many calls that overlap. Stepping out for 30 minutes. 56-y TOM- THANKS YOUR COMMENTS read the pr and felt encouraged that they were on the right track. About to read the CC. I think the key is that they now understand that they are not a C corp and can not coupe with the heavy depreciation after initial well drilling. They have to buy more older wells which are already in or close to steady decline rate. For them wildcatting or anything close to it is just wrong.VNR has always understood that. Unfortunately, BBEP does not or acts as if it does not. Thanks again your inputs. Z – how you arrive at potentially 100mm for SDCJF's assets in Oklahoma? Don't have to get super detailed just curious about your thought process. (Bloomberg) — Iraq exported the most oil in more than three decades last month, overcoming violence and instability to ship more than 3 million barrels a day to world markets. OPEC’s second-largest producer shipped 92.3 million barrels in April, Oil Ministry spokesman Asim Jihad said by text message Friday. That’s equivalent to 3.077 million barrels a day, compared with 2.98 million in March. Iraq, with the world’s fifth-biggest oil reserves, is rebuilding its energy industry after decades of war and sanctions, while fighting Islamic State militants who seized a swathe of the country’s northwest. The increase of more than 3 percent from March shows Iraq is achieving more stable exports following weather disruptions that hampered shipments in February, said Richard Mallinson, an analyst at Energy Aspects Ltd. in London. About 78.8 million barrels were exported from Iraq’s southern oil fields, while 13.5 million barrels came from the north, Jihad said. The exports were sold at an average price of $51.70 per barrel, generating $4.8 billion in revenue. Iraq pumped 3.3 million barrels a day on average last year, the most since 1979, according to data compiled by Bloomberg. The Organization of Petroleum Exporting Countries, of which Iraq is one of 12 members, pumped 31.3 million barrels a day last month, according to a Bloomberg survey of oil companies, producers and analysts. This is from the proxy statement…Purpose of Amendment and Use of Shares We do not have any immediate plans to issue any shares of our common stock "other than those currently reserved for issuance." However, as shown above, we have only a small number of authorized but unissued shares that would be available for future issuance in the event that such plans arise. At $7.03 per share, the closing price of our common stock on March 12, 2015, the record date for the Annual Meeting, we would have available for issuance only approximately $128.5 million worth of our common stock. they basically say up front they are going to issue ~ 25% more shares (18m/71total float). that has been priced into the security at this point. DJ: S&P Revises Rosetta Resouces Outlook to Neg; Cuts Debt Rtg — Cites 'Significant' Fincl Risk. Z, any color? TIA. $55 mm – OEDV TEV / ~ 5,000 net Nemaha Ridge area Miss Lime/ Woodford prospective acres = $11,000 net per acre putting nothing on the production value of the company which should be another $50 to $75 mm. SDCJF has ~ 34,000 net acres there (going to 27,000 net with lease expiry expected this year) and 1,300 BOEpd. So you can either go with 27K net acres x $11K/ acre = ~$300 mm (too high) or $50K per flowing BOEpd = $65 mm (too low given the size of the position). re 65 – thanks – our thoughts were in a blurb on that in the commodity watch section of the post. re 67 – what name? re 69 – likely just a comment on oil prices and EBITDA as a function of them. Meh. MRD – love it when a plan comes together. Beerthirty a little early, have a great weekend. Natgas with a nice weekly key reversal. Change of trend direction for natgas prices at hand? SWN and CHK broke out on the P&F charts today. Others (AR, COG, EQT, MRD, RICE, RRC, WPX) already have done so. GPOR re-tested its breakout and held. REXX (+5% this week) and UPL (+14% this week) look poised to launch into breakout mode.